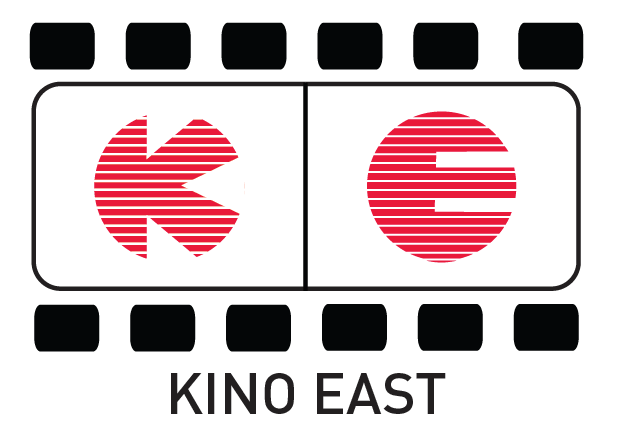 It’s fairly interesting to think about cinematic production within a country like Ukraine, in a decade that is bookended on one side by conflicts over its territory by Russian and Poland, and on the other side the man-made famine Голодомор (Holodomor). Each event cost millions of Ukrainian lives and were the direct influence by outside powers. These two devastating events in history potentially had as much influence as Russification did on Ukrainian cinema of the 1920’s. As such, a cinema style focused mostly on aesthetics of lyricism seems best for an audience that would want to detach from that harsh reality. This poetic style is rooted in the early works of Олександр Довженко (Oleksandr Dovzhenko) and seen in the works of many later directors such as Юрій Іллєнко (Yuri Ilyenko). It’s in this context that ДВА ДНІ comes as a surprise, a film rooted not just in realism but one that resonates with the emotions of its nation through an identifiable character. Director Стабовий created a film that was more in line with the aesthetics that would appear in the next decade, Soviet Realism. But ДВА ДНІ deviates from that style in several ways, by focusing on an individual instead of the collective, and the absence of heroism. This creates an experience that is balanced between Ukraine’s poetic roots and the forced Soviet Realism. 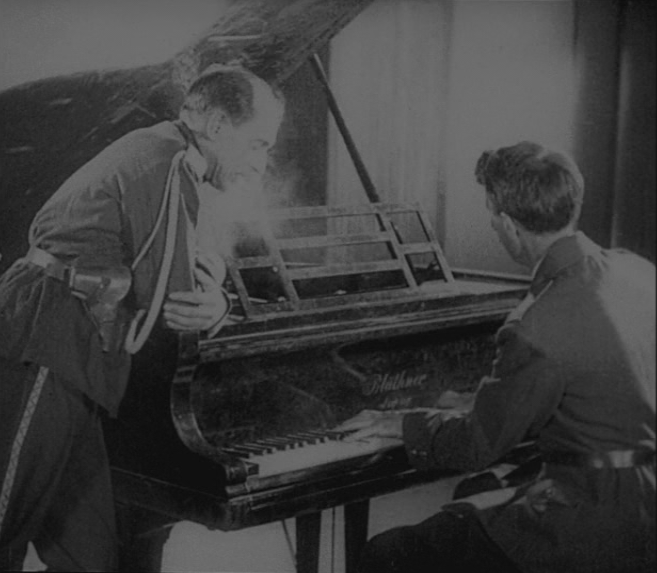 Though in a modern era, the film can be viewed as potentially propaganda, something Стабовий would do later in his career, there are elements that conflict with this idea. It’s important to note that many key Ukrainian directors of the twenties would at some point in their careers focus on propaganda including Довженко. ДВА ДНІ begins with the Red army about to invade the town, with fighting already at the doorsteps. An estate owner is packing up his valuables and his family, and leaves the property and its hidden valuables in the care of his loyal servant Antin. 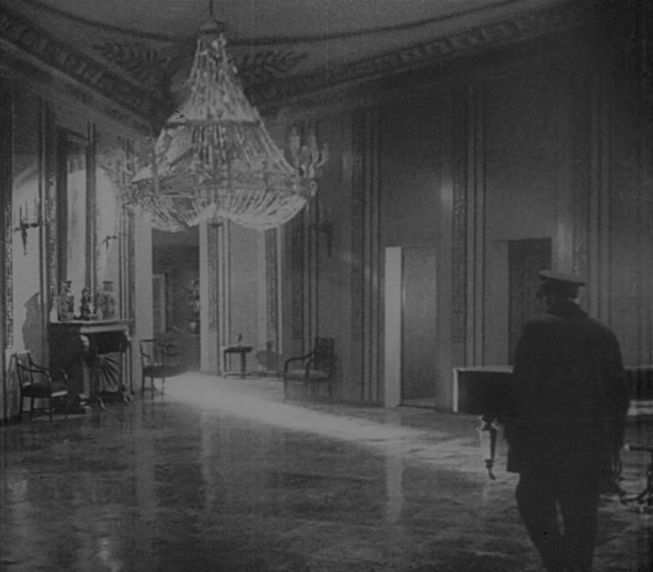 The son of the estate owner gets lost at the train station and returns to the estate in fear of the Red Army. The estate is eventually found by the Red Army who want to set themselves up in it as a base of operations. Antin discovers his son leading the Bolshevik squad, a son that had been missing since he enlisted with the Russians in the first Great War. Antin, loyal to his master, hides the Son of his master in his quarters, keeping him hidden from his own son. Antin becomes torn between the love for his son, and his loyalties with the family he works for. While Soviet Realism wasn’t an imposed aesthetic until the thirties, ДВА ДНІ still challenges some of those ideals that were already ingrained in Soviet Cinema. Стабовий chooses to put the focus of the film on two characters and their relationship, Antin and his son, instead of a collective group. This helps the audience to relate with the central character of Antin, who is feeling trapped between two political ideals that are both willing to sacrifice Antin for their own benefit. This sense of being trapped between two opposing powers, while being powerless himself, is why ДВА ДНІ resonates so well with a Ukraine of the twenties. The focus on individuals is also what makes ДВА ДНІ a compelling drama, as Antin’s relationship with his son further complicates what he thought were his personal ideals. ДВА ДНІ also combats the Soviet theme of heroism by having no character that is morally superior. Though true, the White Army can be seen as the most morally bankrupt, unflinching in its decision to hang Antin’s son and shown returning to town in a montage with the collaborators that they kill. What’s interesting, though, is how Стабовий contrasts both the Bolsheviks and the White Army. Both of them inhabit the mansion in a similar fashion, from unloading their equipment and playing on the piano to how they lounge in the study and smoke cigars. If it wasn’t for their uniforms, it would be hard to tell which army was currently occupying the mansion. By the end of the film, even Antin is filled with the same rage that is enveloping the country, and we are shocked to see him shoot at his victims as they try to escape their burning tomb. 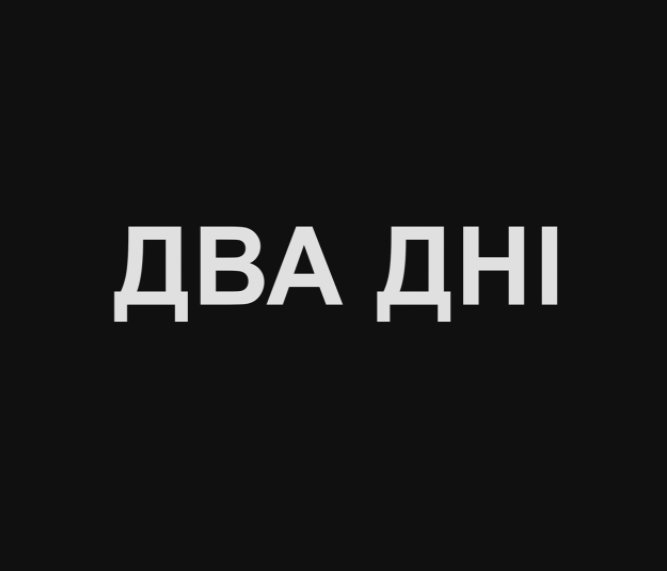 Finally, the ending of ДВА ДНІ has an interesting deconstruction that can be viewed with two different perspectives. As an audience, we can view Antin’s actions as being the result of a personal revolution in which he enacts his revenge upon both the White army and the upper class. Antin is lead to this rage through personal tragedy by both the young master’s betrayal and witnessing his son’s hanging. The alternative viewpoint can be taken from a modern perspective, that Antin’s predicament is solely brought on by his son’s decision to become politically active. However, this viewpoint feels like a cheap trap, one that relies solely on negative emotion tied to socialism. Perhaps its better to view ДВА ДНІ from the first perspective but to expand on the ideas that it was meant to drive a passive audience into any stance, whether it was for or against a political shift. Стабовий’s feature film career was short, shooting just a couple more films before moving to Moscow to direct Soviet propaganda. He would enlist with the Red Army in World War I, and after the war began a career as a playwright. His successes as a playwright quickly lead to success at screenwriting. A film he wrote the screenplay for saw the director removed because of trouble with his alcoholism. The film was such a success that Стабовий began his career as a director. 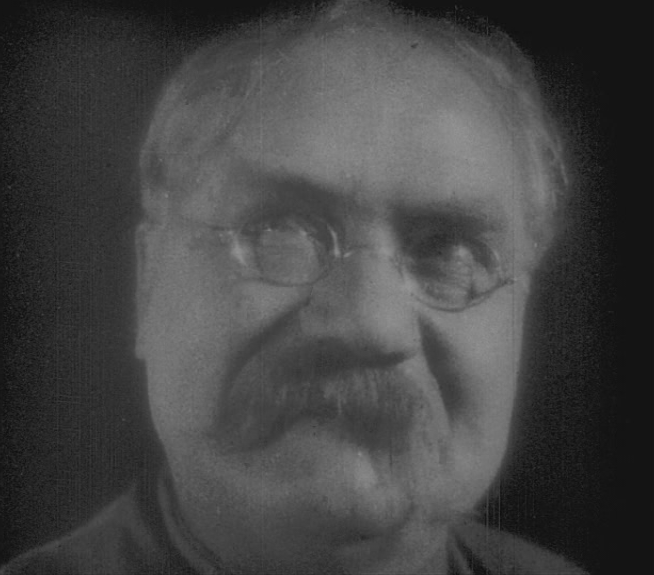 His debut film would be Свіжий вітер (A FRESH WIND, 1926) and would also mark the debut of cinematographer Данило Демуцький (Danylo Demutsky). Демуцький is by far one of the most talented Ukrainian cinematographers, being one of the first to really translate his photographic mastery of shadows and light to cinema. The imagery he creates in ДВА ДНІ is one that is both documentative and deeply personal. 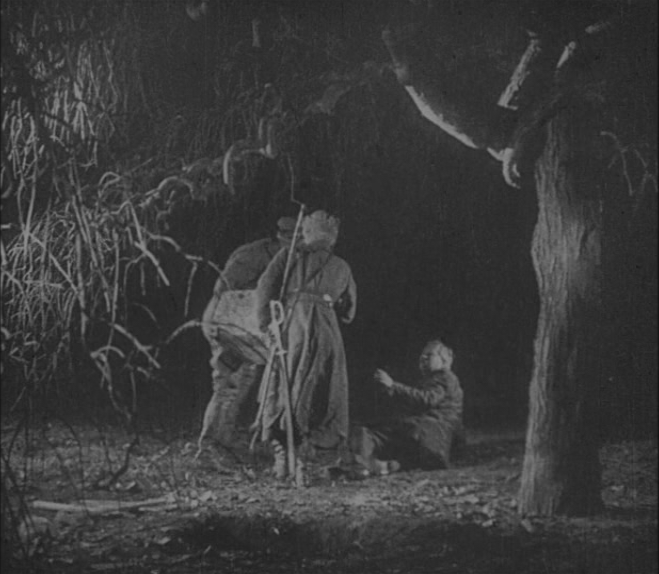 Some of the greatest scenes of ДВА ДНІ takes place a night, using the lack of light as an effective metaphor for the crisis at hand. 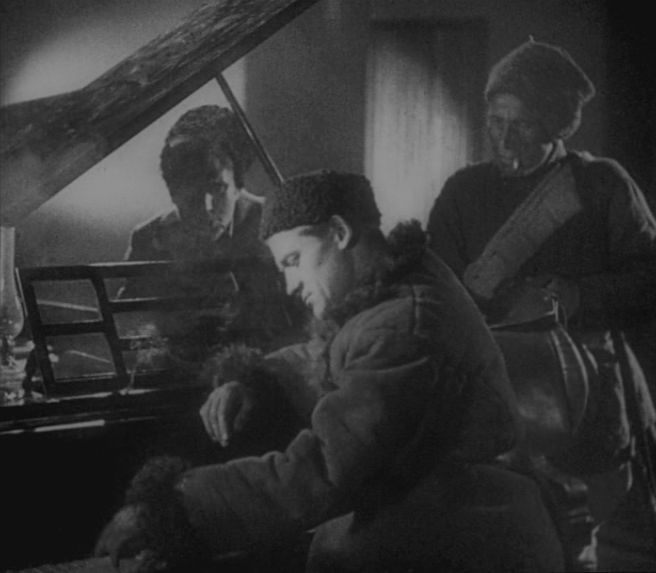 After working with Стабовий, Демуцький would later collaborate with Довженко (Dovzhenko) helping to create his poetic vision appear on film. Демуцькийwould lead a very successful film career but be haunted by frequent imprisonment over his work on certain films.